Civic learning is a process through which young people develop the knowledge, skills, and commitments to interact effectively with fellow community members to address shared problems. It includes preparation for both civic engagement (or practices seeking to promote the public good through non-governmental organizations and informal community work) and political engagement (or activities aiming to influence state action through formal avenues such as voting, lobbying, or petitioning).1 There are many practices that directly improve the quality and effectiveness of civic learning in schools,2 including civic action projects; digital literacy education and engagement; classroom instruction in government, history, law and democracy; discussion of current events; service-learning; extra-curricular or co-curricular activities; student voice in school governance; and simulations of democratic processes. 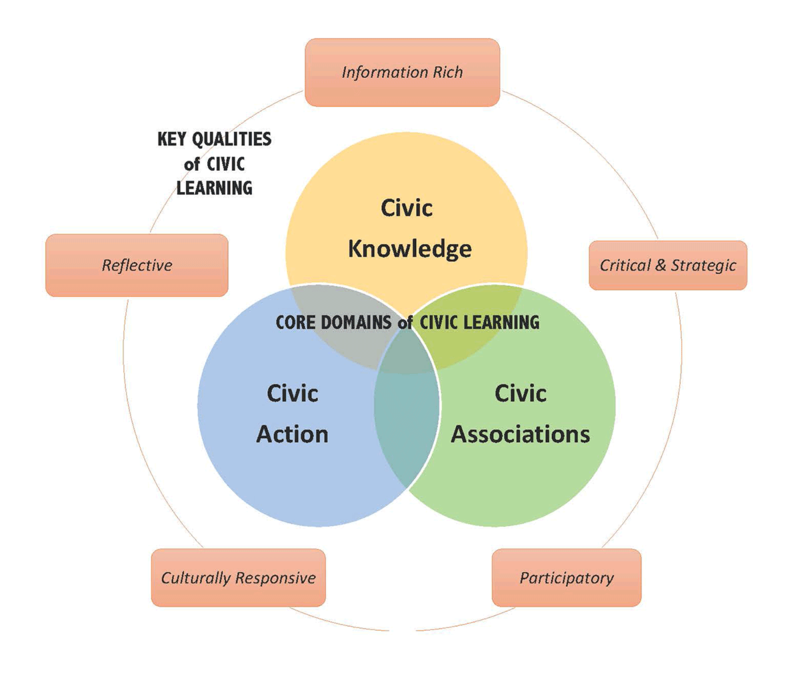 Drawing on these practices and research in the field, the LEADE framework of civic learning aims to promote civic knowledge, civic associations, and civic action. The LEADE framework also posits that high-quality civic learning is information rich, critical and strategic, participatory, culturally responsive, and reflective. To read more about the LEADE framework and these features of high quality practice click here. 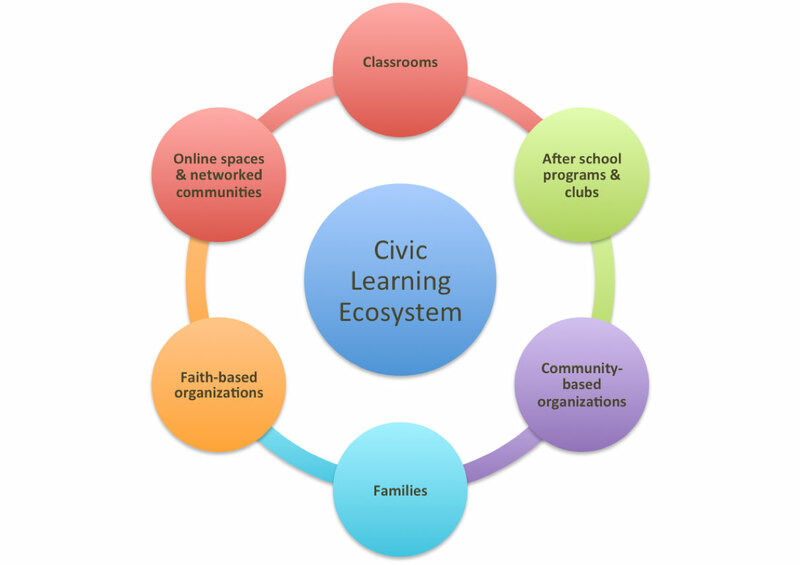 Where Does Civic Learning Occur? Civic learning takes place in a range of settings. LEADE works with districts and communities to collect data about students’ civic learning opportunities inside and outside of school. Research shows that a variety of civic learning opportunities, delivered both in and out of school, can foster greater and more informed civic and political engagement among all youth, and in particular among youth from low-income families, youth of color, and immigrant youth. Indeed, high-quality approaches to civic learning also appear likely to promote the skills needed for the 21st century workplace, such as critical thinking, collaboration, creativity, initiative, and innovation. In addition, it can improve school climate and safety, lower schools’ dropout rates, and promote academic achievement aligned with the Common Core State Standards. 1 Verba, Sidney, Kay Lehman Schlozman, and Henry Brady. Voice and Equality: Civic Voluntarism in American Politics. Cambridge: Harvard University Press, 1995. 2 Gould, Jonathan, Kathleen Hall Jamieson, Peter Levine, Ted McConnell, and David B. Smith, eds. Guardian of Democracy: The Civic Mission of Schools. Philadelphia: Lenore Annenberg Institute for Civics of the Annenberg Public Policy Center and the Civic Mission of Schools: Philadelphia, 2011.